I apologize for the lack of postings recently. Some days it is difficult to put my experience into words, and other days it all seems not so interesting. Now it is December, and suddenly, time has passed. Christmas and New Year’s are only a couple of weeks away; I’ve now been here for 8 months. This week is final exams for the semester. My load will not be as heavy, although my students are stressed and weary from much homework on top of studying for their finals, as well as the other work and responsibilities they have throughout the week—all with very little rest. I hope to share more stories in the coming days. Below are some pictures from some recent events. For more, please explore my Indonesia Collection on my Flickr page. R A I N. It’s the rainy season here in North Sumatra, and this photo is a creative shot from a storm in Pematang Siantar back in November. This is the view outside the door from my little room where I stay when I teach at Nommensen University. 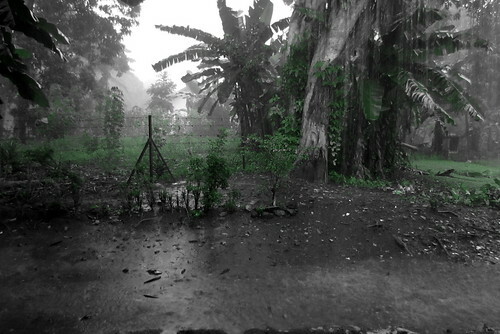 The heavy downpour lasted for hours, accompanied by lightning and thunder. A small stream of water rushed past the patio from all the rain soaking the ground and pouring from the roof. M I N I S T R Y. These are a few of my students in action, giving talks about health to people in the village of Siboruon, outside of Balige. 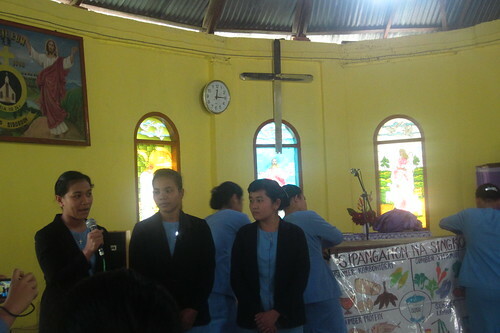 The presentations came after the Sunday worship in the village HKBP church and were on topics about healthy eating, traditional medicines, and breast feeding, and HIV/AIDS. Find more photos from this day here. F U N. On the same day as above, after the worship, presentation, and a nice meal of saksang, we hiked to a nearby waterfall. The path was at times steep, and very muddy. It was best to take off the flip-flops and hike barefoot. 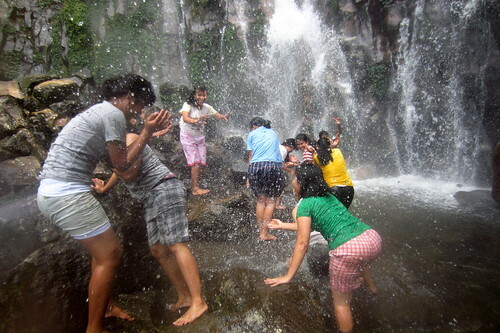 Our treat for the slippery hike was this gorgeous waterfall to play in. My students, never having experienced a hike in the North American mountains with water that flows from melted snow, thought this was cold; I was pleasantly cool, and had a blast splashing and standing under the falls. In spite of being cold, as you can see, they had fun, too. 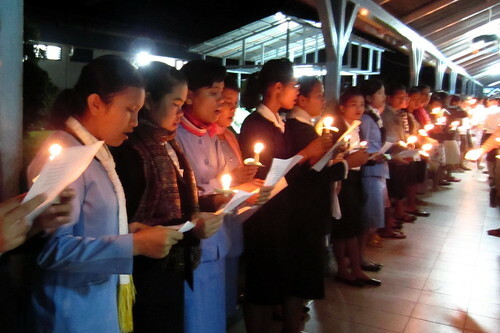 A D V E N T. On the first Sunday in Advent (Dec. 2nd), the students walked around town singing Advent hymns by candlelight. I joined with. We began at 4am with the hospital across the street. This photo is my students lined along a corridor (in this hospital the hallways are all open air) singing with the nursing students. We then walked around town, leaving advent wreaths and candles at some select homes. We also sang in the courtyard of the local prison. Altogether, it was a beautiful morning, well worth leaving at 4am. Find more photos here.